the Market IV, originally uploaded by shaunaforce. I have a confession to make: I’m addicted to food shopping. You know how some women are so slavishly excited about shopping for shoes that, when they pass a tiny boutique with impossibly tall shoes on little stages, their friends have to pry them away from the window with stern admonitions about not being able to afford any more pairs? Well, that’s not me. The other night, some friends of mine and I were talking about the big birthday I have coming up this summer. And thinking Carrie Bradshaw, I joked: “Hey, maybe someone will buy me a pair of Manolo Blahniks!” My friend Paul said: “I don’t see you in those. It’s more likely to be a pair of Keens.” It’s true. I like shoes. I do. I’m still a girl. But I just can’t stand high heels. I don’t see the allure. So that makes my ears deaf to the call of the shoe store window. Some women must buy new clothes, every season, or have that adorable little blouse in the window, or reel with horror at the idea of wearing the same outfit twice. I buy all my clothes at thrift stores. I have my own sense of fashion, and I only buy designer labels. It’s just that every piece is ten dollrs or less. And so last season. Actually, I don’t think I’ve brought a single new-to-me piece of clothing into my house in six months. I suppose I should go looking again, but there’s always something better to do: make a meal, feed friends, laugh loudly. Later. So, luckily, I’m not drawn into Nordstorms for their half-yearly sale like a zombie who needs fresh meat. This saves a lot of money. Bookstores and record stores are always dangerous, of course. But somehow, either my entire memory of the twenty-two new albums I wanted is wiped clean by the rows upon rows of music available to me, or I just can’t balance that stack of books I want to read piling up in my arms with the bill building up in my checkbook. So in both places, with some difficulty, I can practice restraint. But in grocery stores? Farmers’ markets? Little shops dedicated to oils and jams and spices? Forget about it — I’m a goner. I’ve always been happy while slowly sauntering down a long aisle of little jars filled with thick tapenades or symmetric cans of tomato sauce or an expansive selection of soups. 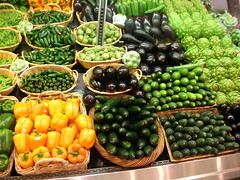 Walking through a grocery store promises fragrant foods, chewed and savored, soon. Every new category of food — breakfast cereals; expensive juices and cold drinks; olives and capers stuffed into glass bottles — evokes memories and inspires possibilities. The produce section brings dark-green zucchinis standing at attention, vibrant artichokes blooming in profusion, and round-bottomed eggplants just begging to be fondled. Let’s not even talk about the cheese section. I’ve been known to linger so long there, sampling sharp bites and soft nibbles from all over the world, that all the employees know me by name and push the most expensive cheeses to the front of the case when they know I’m coming. That is me at my most addicted, not able to move, wanting it all. Then again, there is also the chocolate aisle. So I’ve always been happiest in a food store, far more contented than in the Gap or Barneys or even Elliott Bay Bookstore. Food is so primal, deeply sensual, and provides such immediate gratification that I can sometimes walk through a farmers’ market in a fugue state of orgiastic possibilities. Look at all that fruit! However, since I’ve had to go gluten-free, and started this website, even I have to recognize that my favorite shopping habit may be growing out of control. After all, whenever I spy something luscious that doesn’t contain gluten, I can’t help but grab it. Truthfully, packaged gluten-free cookies or pretzels no longer intrigue me, the way they did when I was first learning to eat this way. I can bake those at home now, almost without thinking about it. Instead, it’s the tiny tastes and decadent pleasures that capture me every time. A bottle of pomegranate molasses in a tiny Middle Eastern shop in Pike Place? Of course. Neal’s Yard cheese at $22 a pound? Well, David did just extol its virtues a few days ago; maybe there’s a tiny sliver for sale. Marcona almonds, direct from Spain? Perfect for my Friday-night dinner party. Fig spread from Dalmatia? Oh, it’s so expensive, but I’m sure it’s gorgeous. Green tea with mango, basmati rice from India, grey sea salt from Brittany? How could I not treat myself, when I have to go without gluten? And of course, since I’m keeping this website, and so many of you are writing to me, asking for particular recipes, or advice on how to eat gluten-free, I feel a real tug — nay, a true responsibility — to sample any food that doesn’t have gluten. How else can I recommend the world’s food to you if I don’t eat little nibbles of it all? There’s such a comfort in the pattern of discovery. In Seattle, I’m blessed with a plethora of choices for food shopping, so much so that I can make my rounds on a rotating basis and never feel like I’m stuck in a rut. Whole Foods on an errant Saturday afternoon. Central Market — my new favorite — when I’ve planned ahead enough to make the fifteen-minute drive north. Metro Market when I’m in a rush. Wait — I haven’t been to PCC for weeks. And of course, on a nearly-daily basis, Ken’s across the street keeps calling me in. Now that it’s spring, I’m back to wandering the stalls of the Market (Pike Place to those of you who don’t know) three or four times a week. And soon, all the farmers’ markets will unfurl their fruits and vegetables for us all to peruse, and I will be perfectly happy, once again. I’m not ashamed. I’m only admitting it — I’m in love with food shopping. I’ve never felt so alive as I have this past year, eagerly reaching for every new food I had never eaten before. Like Amelie, I’d love to plunge my fingers into barrels of beans, run my hands along spiny vegetables, and savor the sounds of everything around me. If I could, I’d stand in the middle of the Market, eyes wide open, arms spread wide to embrace it all, taking in every smell and texture, then dance down the aisles, humming to the food tune always playing in my mind. One of the benefits of being a total food-aholic is that my pantry is -- quite frequently -- wonderfully well-stocked. Truly, I must have the most interesting, perpetually kept pantry of any person who lives alone that I know. No scrimping here -- why would I wait until I have more people in the house to live well? With all my food wishes fulfilled (sometimes), I have the chance to experiment and play with recipes that call for a number of wacky ingredients. Like this salmon. 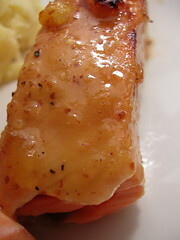 I must admit, my favorite way to make salmon is still a simple broil, with lemon juice, fresh garlic, and olive oil. But since I eat so much salmon, I like to play around sometimes. And here’s a dish worth fooling with, something to make any Sunday evening far more scintillating. Its succulence and surprising sweetness, cut by the heat of wasabi and ginger, will make everyone as happy in eating as you were in buying the ingredients. Preheat the oven to broil. Place the salmon on a tin-foil-covered baking sheet. Mix all the ingredients, besides the salmon, in a small bowl, and stir them well. Spoon half the marmalade delight over the salmon. Use a pastry brush to coat the salmon. Put the salmon under the broiler for six minutes, or until it's bubbly. Immediately brush the remaining marmalade mixture over the salmon and broil for a remaining two minutes. The inside will still be a slightly darker pink than the rest of the fish, but the salmon is now succulent and ready to eat. LOL, I know what you mean ... there are days when I am afraid to go near a supermarket! The salmon looks amazing. I've always like matching salmon with citrus - that is making me very hungry. Thanks for such a great post. It really hit home. I have just recently realized how my own shopping habits had changed--and it is wonderful! I absolutely love to shop for anything food related. Will try your salmon recipe tonight. Sounds wonderful & I just happen to have the ingredients! I just found you at Bakerina's! I used to live in West Seattle and have a fondness for all those groceries and shops that you mentioned. A year and a half ago, I moved to Burlington VT and found a natural foods store that has a better assortment of gluten-free foods than PCC and a local baker of wonderful gluten-free bagels, coffee cakes, carrot cakes, cookies, and pecan tassies. This summer I am looking forward to a trip to Atlanta where I will be somewhere within reach of a Whole Foods again. Thanks for blogging the gluten-free life. I confess, I too am similarly addicted. I thought I was the only one... If there is a 12-step program, I refuse to attend and will go on with my shopping aisle lingering and farmers' market haunting. I have found that one good thing about being GF is that I now have an excuse to pick up every package and read every label - which I have always done anyway. Shauna...your aren't alone...I'm a food shopaholic too! I hope you did buy that Dalmatia Fig Spread because it is wonderful with Manchego Cheese. I wait patiently for the DeLaurenti and Pasta & Co's newsletters to deliver via email so I can put more things to shop for on my already growing list. I can't wait for Whole Foods to open at Denny & Westlake. The other day I found out about a new Deli/Market that opened up close to my bus stop downtown and I was counting the hours until I could go there and discover what was new! Meanwhile I'm counting the days until the Farmer's Markets open! What a bounty we will have for the Spring & Summer months. We are blessed to live in Seattle! Isn't it nice to have addictions that are not harmful? I mean to be addicted to food shopping is not so bad because you are going to use everything you buy. I'm addicted, too, especially to fruit's lusciousness. I swear that if I could pick a different form of life to try out, flying fox would be high on the list. Yes, it'd be exhilerating to know flight, but really it's just because I'd get to stuff my head into the sweet innards of ripe fruit to dine every night. Mmmmmm. I'm SO right there with you, Shauna, and glad to know I have a sister in crime! Although no shame here, either, except, perhaps when LB discovers one of my extra new finds in the pantry - but then he benefits from it, and all his harassing goes right out the window! I don't even remember the last time I bought an article of clothing...but my second weakness isn't food, it's food equipment! who wrote this? you? me? i'm so with you on this. I once celebrated my birthday at fresh fields (what whole foods used to be called in Washington D.C.), that's how much of a food shopping/dork I am. Oh, and the link you had to that other gentlemen's website made my computer go nuts, opening over a hundred different browser windows. When I tried to close one, another one would just keep opening. I don't know if that's a virus or even if it has anything to do with your link, but I thought I should let you know. Oh, Shauna, once again we sing the same song. I can't stand mall/clothes shopping (catalogs are my savior) but I can spend all day at an open air food market. And when traveling overseas, one of my must see sites is always a local grocery store. Even before my gluten problems I was addicted to food shopping. I'm addicted to shopping for clothes and shoes and antiques, too, but I don't indulge nearly as often because shopping for food is -- guilt free. I just can't deny myself the pleasure of food. Also, I just found your blog and wanted to say THANK YOU!!! for the great recipes. I have once more found hope in my gluten free kitchen. I just got my tax stuff together, and looking at my checkbook I was struck with how many checks had been written to the various food stores I go to--a couple of organic food places, a farmer's market, an old-style ethnic marketplace. 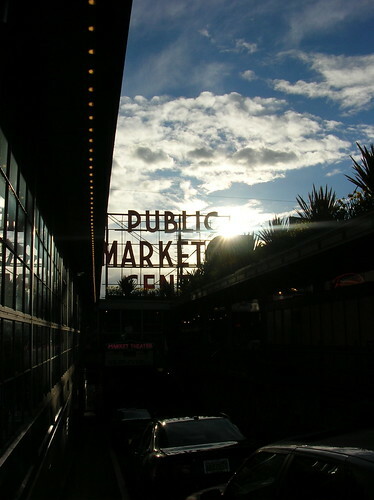 I fell in love with the Market the first time I visited Seattle. I feel so very lucky to live here now. A couple of days ago, I discovered at the back of my basement "jam cellar" a small cache of orange marmalade that I made last February! Now I know what I'm going to do with it. But, you all realize that over-shopping for food can lead to freezer spelunking! And I don't even own any zaatar yet! Out of the last 10 entries in my check-book, 8 of them were food, wine, or dinner out. It's really quite a beautiful obsession, and you did a great write-up about it. I'm also with you on the thrift store shopping... love them! What a wonderful post!! Tea sent me here after reading a post I did on food markets in Asia. Your words "...never felt so alive ...", describe me anytime I'm at a wet market. Oh, how I can relate. I laughed right out loud while reading this post. Suddenly I feel like running into the street and yelling "See, there are other people just like me, people who would rather shop for food than anything else!" I am laughing aloud by myself under the roof of another rainfall. This is why I have a jam COLLECTION! This is why I love stores I can buy in bulk! This is why I am eating and snacking all the time! I admit it is not my only addiction. stationery and sheets too. But every city I visit, every country, I go straight to their health food stores and farmer's markets. You are so in tune my dear. In tune! I, too, am an addict. All those wonderful cheeses - how can I say no? There's a reason many of my friends call Whole Foods, "Whole Paycheck". I just discovered your blog and love this post. I'm definitely going to start reading you regularly. My wife is close to tearing out her hair sometime figuring out our family menu. My son has celiac disease. I was just diagnosed with Type 2 diabetes. Finally, our whole family keeps kosher. Hi Shauna, I love the first shot, gorgeous! Hi Shauna, This recipe looks amazing! One question: we have an industrial gas oven in our apartment (which we love), but it doesn't have a broiler setting. The oven comes with a broiler setting, but needs a separate gas line to work, which we don't have. Any ideas on how to cook this fish without broiling it? Will baking work?